“We’ll invest in biomedical research, information technology, and especially clean energy technology  an investment that will strengthen our security, protect our planet, and create countless new jobs for our people,” the President said. The Sustainable Energy and Environment Coalition, a caucus of 47 House Democrats founded in 2009, immediately welcomed the President’s emphasis on clean energy. 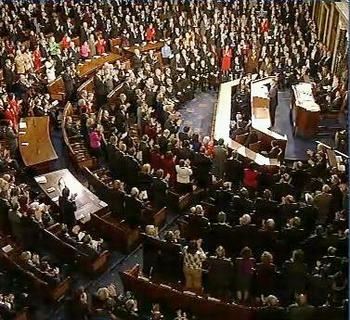 Republicans and Democrats sit together during the State of the Union address. In a Sputnik moment people realize they are threatened and have to race to catch up as in 1957, when the Soviet Union launched the first satellite, the Sputnik 1, and beat the United States into space. “We’re not just handing out money. 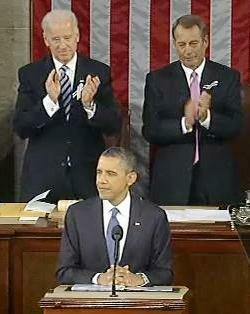 We’re issuing a challenge,” President Obama said in his speech. “We’re telling America’s scientists and engineers that if they assemble teams of the best minds in their fields, and focus on the hardest problems in clean energy, we’ll fund the Apollo Projects of our time,” he said, referring to the United States spaceflight program that landed the first humans on the Moon on July 20, 1969. “With more research and incentives, we can break our dependence on oil with biofuels, and become the first country to have one million electric vehicles on the road by 2015!” Obama exclaimed. 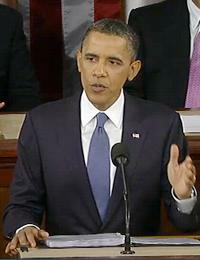 President Obama promised to maintain environmental safeguards. Environmentalists were quick to support the President’s clean energy goals. 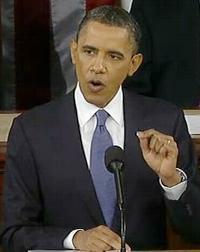 In his speech, President Obama reminded the assembled members of Congress that this month he ordered a review of government regulations to reduce barriers to growth and investment. National Farmers Union President Roger Johnson said the farmers and ranchers in his organization are eager to rise to the clean energy challenge the President issued in his speech. The official Republican response to President Obama’s State of the Union address from Congressman Paul Ryan of Wisconsin did not mention clean energy. While it focused on cutting spending and reducing the deficit, it did not respond to the President’s stated intention to eliminate billions in taxpayer subsidies for oil companies.